Today we finish up our Mystery #8! Click here to download Mystery Mondays #8 Part 10. It's border day and I have added a thin inner border and an outer border. If you want to keep your quilt smaller just leave off the borders or you can always make them wider if you want it bigger....it's up to you! Here is mine all pieced and ready for quilting! I like to take pictures inside because sometimes the sun washes it out. BUT every time I went to take a picture, Ella walked across my quilt! She is my cutie pie but I really didn't need her help with the picture. Here she is enjoying the sunshine with us this past weekend. Since this is the last week for our Mystery #8, be sure to post a picture on Instagram. Please tag me and use the hashtag #thisandthatmystery so we can all see your finished quilt. Question for you all....would you like to start another Mystery next week? Or wait a week or two to finish this one and then move on to a new one? Let me know your thoughts. Happy Monday to you! Today we are going to sew up the inner border on our quilt top. Click here to download Mystery Mondays #8 Part 9. Sew (14) M units together to form inner border....make 4 of them. I tried to be random in my sewing but you can do it however looks best to you. We will be doing a partial seam to start with. So you will be sewing the inner border strip to the right of the quilt top, starting at the top and sewing ALMOST to the end, leaving a few inches unsewn. Add the border strips to the other sides of the quilt top. Then finish sewing the seam of the right side inner border strip and press. All done for now and next week is another clue! P.S. Don't forgot to post your progress on Instagram using the hashtag #thisandthatmystery and be sure to tag me @sherfalls. It's fun to see what everyone is working on! Happy Monday! Today we are going to sew some units together to form our quilt top. Click here to Download Mystery Mondays #8 Part 8. We will be sewing the units from last week and the units from clue #6 together to form sashing strips. Next week we will start on the border. You can find me on Instagram if you would like to see what I am up to through out the week. I am actually getting pretty good at posting there. 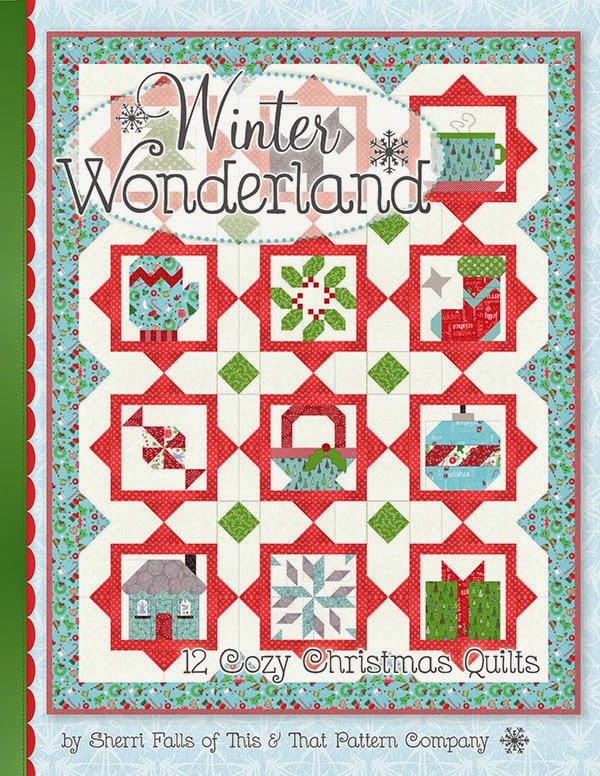 Most of the pictures are of my progress on quilts for my new Christmas book Winter Wonderland. Don't forget to post your progress on Instagram using the hashtag #thisandthatmystery and be sure to tag me @sherfalls so I can see what you have been up to also! Good morning! Hope it's warmer where you are than here where I am. I am so looking forward to spring and realized today that daylight savings will start in just a few weeks...YAY! Even a little more sunshine helps my mood these days. It's just been way too cold this year. Anyways, it's time for some Monday sewing and I am glad you are sewing along with me. I am very excited about this project and can't wait to have it hanging in my house. Click here to download Mystery Mondays #8 Part 7. Sew the background rectangles to both sides of the accent rectangle and press. Then stitch the longer background rectangle to top of accent rectangle and press. Be sure to post your progress on Instagram using hashtag #Thisandthatmystery and tag me @sherfalls so we can all see how your project is coming together! Good morning! Are you ready for some more sewing? Did you get all your pieces cut last week? I realized when I was sewing up my clue this weekend that I forgot to list the accent fabric on last weeks clue. You can click here to download Mystery Mondays #8 Part 5 again or just grab a large scrap and cut (5) 1 1/2" accent squares and label them (N). We will be sewing up some of the sashing units today. Click here to Download MysteryMondays #8 Part 6. Here are my pieces all cut and ready to sew! Start with drawing a line of the back of the two larger background squares. Layer the background squares with the the main squares.Stitch on both sides of the line.Cut squares in half and press. Now draw a line across two the squares again. Layer with the other two squares and stitch on both sides of the drawn line. Cut apart and press. You now have four hour glass blocks. I pressed toward the blue and then the final seam I pressed open. Lots less bulk and it helps to line up the centers. Now stitch (4) background squares together with (5) accent squares to form a 9-patch block. Again I pressed toward the darker color and pressed the final seams open. This is my favorite way to press...with the final seams open! Thanks for joining me with this Mystery! You can follow along with me on Instagram. Be sure to use the hashtag #thisandthatmystery and tag me @sherfalls so that other can join us too! Happy Monday to you! We have some cutting to do today. Yes, I confess I am the messy creative type of person. But it looks so happy and cheerful so that's good! What do you do with your scraps? I would love to hear your method and plans. It's cold outside but the sun is shining and there is another clue to our Mystery to reveal! Today is going to be simple but we all need a day like that sometimes right? Click here to download Mystery Mondays #8 Part 4. Next week we will start another section of the Mystery and will be cutting again. You will need to gather up 1/3 yd of background (You can use a different background fabric for this part or the same as what you used for your blocks.) 1, fat 1/8th for main fabric and a bunch of scraps. How is your Mystery coming along? Would love to see your progress, so pop me an email or post it on Instagram with the hashtag #thisandthatmystery. It's been fun to see the pictures that are popping up with that hashtag! BUT please know that you don't have to have instgram to join in the Mystery fun. All the Mystery info will always be posted here along with pictures. I will share more book progress soon. 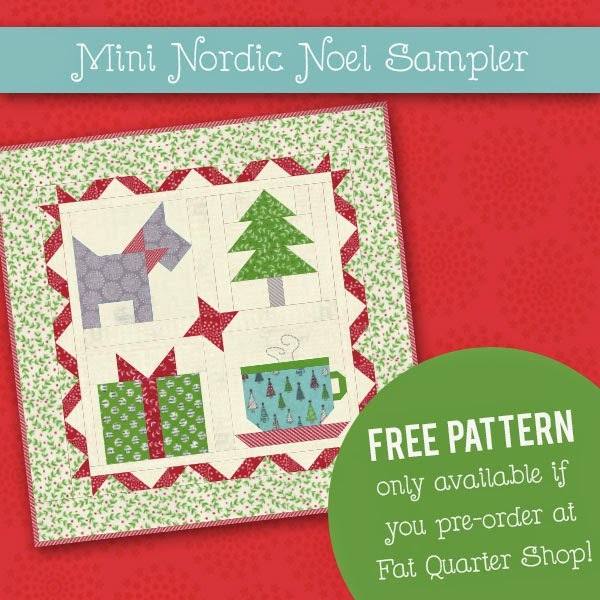 It is available right now for pre-order from the Fat Quarter Shop. I will be having several sew alongs this summer with projects from the book...hope you will join me in the fun! Happy Monday! It's time to stitch up our pieces to create some cute star blocks. Click here to download MysteryMondays #8 Part 3. Then stitch the 4 1/4" background triangles to sides of the remaining star points. More of the Mystery to come next week! Hope you have been sewing along with me. I would love to have you post your progress on Instagram using the hashtag #thisandthatmystery so that we can all see what you have been working. And be sure to ask your friends to join in the fun! Good morning! Are you ready to get sewing on our Mystery? Click here to download Mystery Mondays #8 Part 2. We are going to try to keep this simple and easy so that it's something you can get done each week. I just love working with the Pam Kitty Morning fabric in the winter. At this time of year I think we all need bright and cheerful...I know I do! P.S. What kind of future Mystery's would you like to do? (table runner, full size quilt, bag?!?) Let me know! It's Monday morning...are you ready to cut up your fabrics? I am really excited about this Mystery and can't wait to get started on it. Click here to download Mystery Mondays #8 Part 1. For now we are just working on the blocks and will get to the sashing and border later. One of my resolutions for this year is to be more organized. So to keep my mystery pieces together, I found this cute basket at Target. I think it will be perfect to keep me organized as I work on this Mystery project. How do you keep your projects organized? Next week we will begin sewing! Please invite your friends to sew along with us. You can also follow along with me on Instagram and use the hashtag #thisandthatmystery to share your fabric picks and your progress...I would love to see them! But don't worry, if your not on instagram I will always post the Mystery information on the blog.